1. the old thing is necessary, broken and unfixable (my dad is sort of like MacGyver and would take a broken item and tinker around in the garage for a bit and return with it "fixed". It may be held together by bright blue electrical tape, chewing gum and a twisted paper clip for good measure, but it would probably be able to function). I am sure that much of the frugality in my home was due to the fact that money was tight. There were plenty of things that I know my parents wanted to be able to give to us, but they just couldn't. But, I do think that in addition to that, there was just a mind set that was very different than the mind set of our generation. I feel like we are the generation that is not hesitant to purchase new things. It seems like we do not really have a firm line drawn between "things we need" and "things we want". I am absolutely including myself in this category! This is something that I am learning about myself in a big way. I find that often if I see something that I want, then that is something that I need. It seems like in generations past, people would purchase new appliances because the old ones were no longer working. In our modern day, it is not odd to get new appliances because there is a new version that has a different configuration of deli drawers on the inside, or because the "stainless" look is out and "black" is back in. -Once again, as an avid admirer of all things to do with design, I am learning this about myself too! -Have I modeled this?...Get a newer cell phone, but give the old one away. Get new appliances, but give the old ones away. Get a new shirt at Target because the old one is not as cute, but, yes, I will certainly give the old one away. It feels so much less indulgent when I can justify my new purchases with giving the old ones away to people who really need them. I am thinking a lot about all of this lately. I am thinking that my kids are not as thankful for their things as they should be. I am seeing that there is a "cost" to every thing that we purchase. There is the cost (on our environment) of the fuel it uses to make it, ship it, and house it on the shelves at Target. Even if it is in the dollar bin, there is still a cost attached to it. What concerns me most is that the greatest cost is probably how it shapes my children's world view and how these little things ... little purchases, little moments of giving in, little seasons of splurging in our home ... well, they all add up to be quite big. What I know to be true is that we are not our stuff. Our worth and identity is not equal to what we wear (or, who we wear), the kind of car we drive, or where we live. Stuff is not bad. I am so thankful that we have the things we have, and I think being aware and thankful is a big piece to healthy living in this area. But, I don't want my kids to grow up thinking that they are entitled to everything they see and thinking that this is what makes us happy. We are all are worth more than that. I stumbled on this website the other day and it humbled me even further - www.kiva.org. It was developed by a husband and wife who are pairing up people all over the world who really NEED help with those of us who are privileged to be able to help. They have oodles and oodles of individuals ("entrepreneurs") posted on their site who are asking for micro-loans (small loans in the amount of your choice, from $25 on up) that help them launch their own businesses in order to sustain themselves and their families. 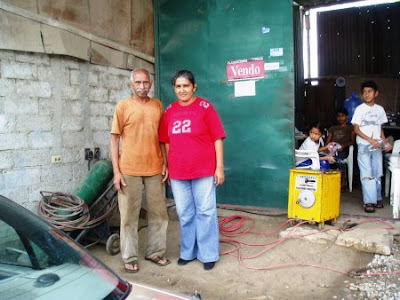 So, the $25 that I could easily spend in non-essential purchases over a week (a coffee here or there, a new shirt at Target, 3 small items from the Dollar Spot), could actually help Marlene from Ecuador [that is Marlene in the photo, in front of her welding shop] purchase the materials she needs to expand her welding shop. We loan money, they use the money and pay it back over a set amount of time. I have been going on this site and just scrolling down the page and really looking at the faces of people in need. It is really, really humbling. But, it also propels me just a bit further towards this investigation and awareness into how we spend our money. I hope to share this site with my kids when the "teachable moment" is just right. I am praying for new eyes. having spent the last week in an orphanage in Haiti, this is REALLY hitting home for me right now!! Love the post...you articulated a thought I've been having A LOT for the last two years. Of course, I went to Target today and bought a few goodies for myself without even blinking. What could we do? The couple that started KIVA are members of a church up here. If you get interested, I'd be happy to connect you through a friend of mine who knows the wife well. i think the starting point is beginning to question our own spending...really watching what we spend our money on and asking each time, do I need this, is this worth this, etc. I have a friend who for a month wrote down every item that she purchased so that she would see the list grow and actually be aware of what she was buying. I would LOVE to meet mr. & mrs. kiva one day. :) I think that their idea was such a beautiful and inspired one. I look forward to partnering with them in some way! My brother had this bumper sticker on his VW growing up that said, "Live Simply So That Others Can Simply Live". That phrase is making more sense to me now than ever before. I am beginning to pray more for eyes to see those in need, and for a thankful heart that recognizes each and every blessing that I have. I am also really trying to pray that God would make me more of a "giver". -I want to learn to give more and more and more of myself and my possessions away with a heart that trusts that as I give away, my needs will always be met. This got long! Hugs to you, Anne! I stumbled on this through a post title of my friend's. Great post. Love the kiva idea, I wonder if there's anything like that in the UK. I think the disposability stretches beyond things, we can tend to use and dispose of people as well and that saddens me. That's not working, well, I'll throw it away and get a new one! I visited your friend's blog - Sam - and loved that post. 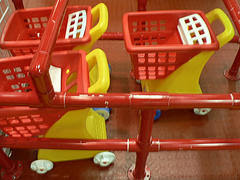 I think that the recession that we are all sliding into is going to stem the tide of our spending quite a bit. But, it would be a beautiful thing, if in the midst of that, our hearts and minds also began to become more aware. My brother had a bumper sticker on his VW squareback growing up that said, "Live Simply So That Others May SImply Live". I like that thought.